I will now summarise the unique pedagogical characteristics of the different media discussed in this chapter. 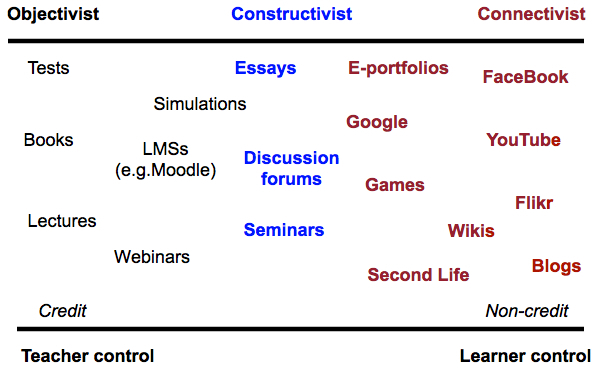 Figure 7.7 presents a diagrammatic analysis of various online learning tools. I have arranged them primarily by where they fit along an epistemological continuum of objectivist (black), constructivist (blue) and connectivist (red), but also I have used two other dimensions, teacher control/learner control, and credit/non-credit. Note that this figure also enables traditional teaching modes, such as lectures and seminars, to be included and compared. Figure 7.7 represents my personal interpretation of the tools, and other teachers or instructors may well re-arrange the diagram differently, depending on their particular applications of these tools. Not all tools or media are represented here (for example, audio and video). The position of any particular tool in the diagram will depend on its actual use. Learning management systems can be used in a constructivist way, and blogs can be very teacher-controlled, if the teacher is the only one permitted to use a blog on a course. However, the aim here is not to provide a cast-iron categorization of educational media, but to provide a framework for teachers in deciding which tools and media are most likely to suit a particular teaching approach. Indeed, other teachers may prefer a different set of pedagogical values as a framework for analysis of the different media and technologies. However, to give an example from Figure 7.7, a teacher may use an LMS to organize a set of resources, guidelines, procedures and deadlines for students, who then may use several of the social media, such as photos from mobile phones to collect data. The teacher provides a space and structure on the LMS for students’ learning materials in the form of an e-portfolio, to which students can load their work. Students in small groups can use discussion forums or FaceBook to work on projects together. The example above is in the framework of a course for credit, but the framework would also fit the non-institutional or informal approach to the use of social media for learning, with a focus on tools such as FaceBook, blogs and YouTube. These applications would be much more learner driven, with the learner deciding on the tools and their uses. The most powerful examples are connectivist or cMOOCs, as we saw in Chapter 5. 1. Take a module or main topic of a course you are teaching. Identify the key learning outcomes then the content area to be covered. 2. Then look through the key characteristics of each of the media in this chapter, and think how each medium might be used to teach your module. Use your analysis from Activities 7.2 to 7.6. Make a list of the functions you have chosen and their relationship to content and skills in the module. 3. Using Figure 7.7, allocate a range of tools and media that you might consider using and place them on the continuum. 4. Are you still happy with your choice? Don’t worry – we haven’t finished yet. The next chapter will provide a way to make decisions on a more realistic basis. The main purpose here is to get you thinking about possible uses of different media in your subject area. 7.7 A framework for analysing the pedagogical characteristics of educational media by Anthony William (Tony) Bates is licensed under a Creative Commons Attribution-NonCommercial 4.0 International License, except where otherwise noted.